X-ray image of the Sun taken by NOAA's GOES-15 satellite on March 9, 2012. 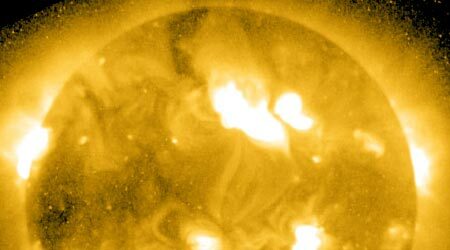 The solar storm that occurred in early March 2012 disrupted satellite communications and forced airlines to reroute some flights. But so far, no major GPS problems have been reported as a result of the event. More solar storms are likely to occur through 2013-2014 as the Sun reaches its "solar max" period. GPS users should keep this in mind and always have a secondary means of navigation or timing. This story was published on March 14, 2012.